This chic black bracelet makes a versatile accessory for any jewellery collection. This black bead bracelet offers effortless sophistication whether you are heading to work or stepping out for the evening. Made from sustainable wood and beautifully crafted by Finnish designers Aarikka, the Pohjola bracelet is a versatile piece of jewellery that belongs in any jewellery collection. 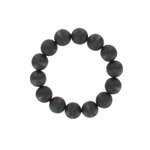 In fashionable black, this lightweight and smooth bracelet can be worn on its own or teamed up with other black wooden jewellery for more impact.